Face of Viracocha in stone at Ollantaytambo (Image credit: Leonard Farra). Throughout the Early World, people had legends about a great civilizer who taught their ancestors agriculture and many useful arts. The Egyptians called him Osiris. In Columbia he was Bochica, in Mexico- Quetzalcoatl/Kukulcan, and in Peru he was known as Viracocha where, like some of the other civilizers, he was reputed to have had the appearance of a white, bearded, man who wore a long white robe and carried a staff. 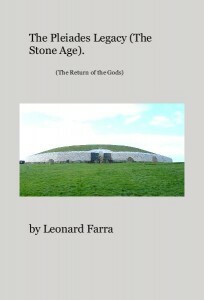 In some legends he was associated with the Flood and the Pleiades. In Peru, and elsewhere in the world, these stars were regarded as the universal mother and they were associated with the agricultural season and crop planting. In a previous article, (The Egyptian Afterlife & The Light Bringers), I explained how Osiris, after at first being revered as a civilizer, was later made Egypt’s chief god of the dead and that all Egyptians hoped to be united with him when they died. Let’s now see what happened in Peru. In many early cultures, including the Andean civilizations, water was associated with the Creation. Titicaca is 12,500ft above sea level It’s one of the largest lakes in South America and the highest navigable body of water in the world. Titicaca Island, off the tip of Copacabana Peninsula in Bolivia, is the largest island in this lake and its most sacred feature was a 225ft long crag of sandstone separated by a wall from the rest of the island.The reason why it was so special is because this was where Viracocha was reputed to have created the world. 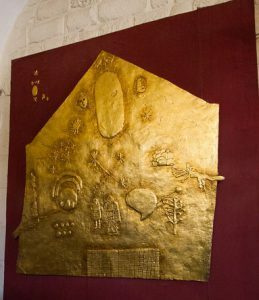 On the nine day June solstice festival Inti Raymi,which began the Inca year, the country’s rulers and high priests gathered there to watch the sun set through two structures and various rituals, which commemorated the creation, were probably enacted. When author James Westerman was visiting this island, because the sun had not yet reached an appropriate position, he was unable to see the Titicaca Rock face. This face probably represented the creator Viracocha. Coricancha astronomical representations in gold (Image credit: Leonard Farra). others had a bird as their companion. Viracocha’s companion was the huge Andean condor which Peruvians depicted in their religious symbolism. Many early religious sites had solstice, and equinox, alignments and major festivals were often celebrated on these four days. The two most important Inca festivals, Capac Raymi (The Great Festival), and Inti Raymi, were held on the December ( Summer in Peru) and Winter (June) solstices respectively. In the Inti Raymi cleansing rituals, dams were opened to allow water to pour down into the valleys and to flood watercourses clean. All fires in Cuzco were extinguished and a new one was lit from a flame focused on a hollow mirror on the fur of a sacrificed animal. 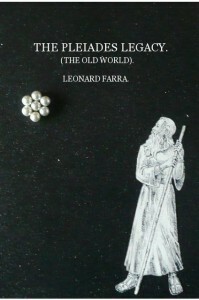 Also in June, people went into the mountains, before dawn, to watch the rising of the Pleiades. The Corincancha temple in Cuzco was the centre of the Incan empire and Viracocha was worshiped there with the Pleiades, the Moon, Rainbow and Venus. This temple employed 4,000 priests and officials and it was out of bounds to ordinary people. The Incas believed that the dead returned on the Winter Solstice at which time they celebrated Capac Raymi. Fourteen days before the climax of that festival, statues of Viracocha,the Sun, Moon, and mummies of the ancestors,were carried in procession from the Coricancha. Capac Raymi ended with a purification ceremony and young initiates bathed in the sacred waters of a mountain shrine. Inti Raymi, celebrated on the June (Winter Solstice), was linked with the harvesting of maize. This festival harked back to the Creation and some of the dancers wore wings to represent Vircocha’s companion-the condor. 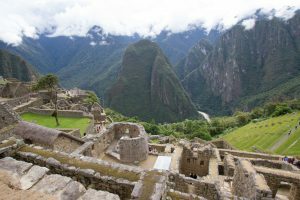 The Incan sacred festivals were also celebrated in other parts of the Empire such as at Machu Picchu where there are equinox and June solstice/Pleiades alignments and a stone representation of the condor. 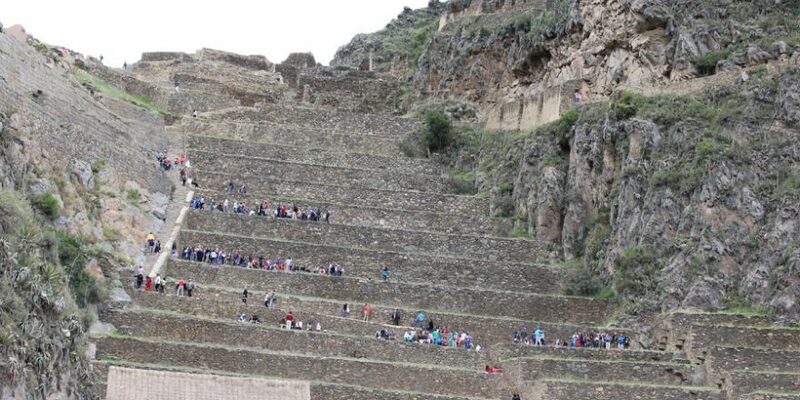 They were also held at Ollantaytambo – a town, and archaeological site, in southern Peru 37 miles north west of Cuzco. Ollantaytambo was an estate of the famous Incan ruler Pachacuti Inca Yupanqui ( 1438-1471) to whom is attributed the Coricancha in Cuzco. 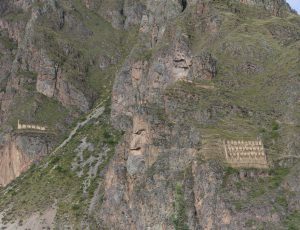 Ollantaytambo’s megalithic ruins appear to have been adopted from an advanced people and its early stonework is said to be not unlike that of Tihuananaco. Its uncompleted ceremonial center was built at the top of a steep hill above wide stairways and terraces. At the base of the ruins there’s a fountain which may have been used for purification rituals. The temple is divided into three areas but the most remarkable structure is the incomplete Temple of the Sun which consists of six pink monoliths each weighing around 50 tons. This temple was an Incan calendar which highlighted the winter and summer solstices when the Inca celebrated their above mentioned festivals. Machu pichu ruins in Peru (Image credit: Leonard Farra). Conch shell trumpets were used by the Incas ,and other people, and It seems likely that at the appropriate time, at Ollantaytambo, and other major Inca sites, they were blown to summon the people to celebrate Capac Raymi and Inti Raymi. In addition to the above rituals, the festivities would also have included the sacrifice of animals, probably llamas. The Spaniards prohibited the celebration of Inti Raymi in the 16th century but it started again in 1944 . As in pre-Hispanic Cuzco , the festivities commence in the Coricancha Square and this is followed by a procession consisting of hundreds of actors in colourful costumes taking the role of the Inca, priests and nobles. The procession, accompanied by music proceeds to Sacsayhuaman amphitheatre where thousands of spectators line the surrounding slopes. As in early Peru, the ceremonies include a sacrificial fire ,the lighting of a new flame, and adoration of the sun. 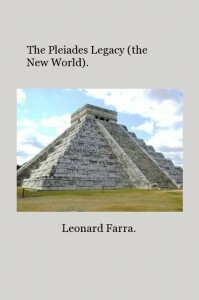 With regard to the Pleiades, Native Peruvian highlanders associate their heliacal rising with the June solstice just as their ancestors did when they celebrated this festival. And the Incas revered Viracocha as the Creator until the Spaniards converted them to Christianity. Tony Morrison, Pathways to the Gods .Granada Publishing. 1980. James W.Mavor, Jr,& Byron E.Dix. Manitou.Inner Traditions International. 1989.